I love finding out about new books and authors new to me. Both sound like fun reads. And who doesn't love a snack? I keep meaning to try to make kale chips- my friends love them. I like pretzels but I accidentally bought two big bags of "lightly salted" for the holidays. More like "unsalted" Dang! I'm gonna eat 'em anyway. 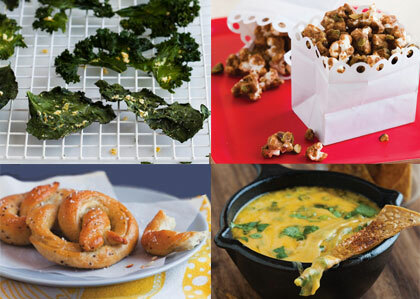 I love to make my own snacks and I'm always looking for great ideas for myself and my readers! 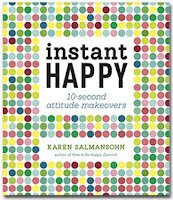 Can't wait to read Instant Happy! 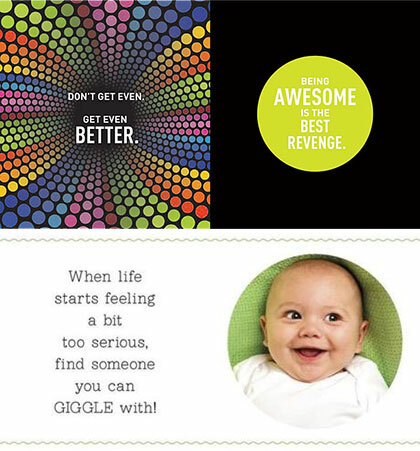 I could always use a book that helps me hack away negativity! And salty snacks aren't as easy to come by as chocolate/sweet treats. The pictures on the cover look scrumptious. Thanks for the opportunity! 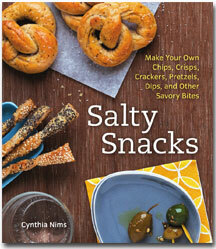 What a good idea - a snack cookbook. That way I (or a friend) can alter recipes to meet tastes or other needs. Yum. 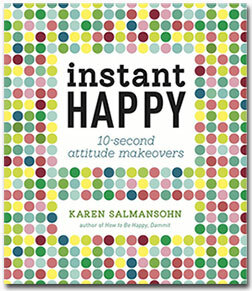 And the happy book? Oh, yes - that would be a nice thing for my desk and I might even want to leave one lying around the office at my part-time job. Yes. Pretzels!! My mom makes a great snack mix with pretzels, cheez-its, M&Ms, and chex. Can't stop eating it. Thank you for this opportunity - both books look incredible and will be a gift for me and then passed along if I win! Popcorn, that's my favorite salty snack, although it hasn't always been...I went through a phase in high school when Corn Nuts were my go-to secret fave....I say secret because I was embarassed to be seen with them! I couldn't imagine a cheerleader or any of the fashionistas at school downing a handful of them!! Cashews, roasted, lightly salted are my second favorite.